Welcome to the Mission 2 The Hunt For Weevil X Walkthrough that covers the entire mission from start to finish. This mission is a hard one to get through; however, if you pay attention to our walkthrough you should be able to get through it just fine. If you can’t pass a part right away don’t get discourage just keep trying especially when you have to play hangman to get the special sleep potion. To check out the full Mission 2 The Hunt For Weevil X Walkthrough keep reading below. As we always do, we have provided you with both the video version and the text version to help you out. This mission starts you off on a beach in which you need to find your missing speed boat parts. The parts are scattered around the beach and are easy to find. You need to locate the motor, propeller, air pump and a wooden stick so you can reach the boat in the water. Once you find all the missing parts walk out to the end of the dock and use your stick to grab the boat. If you can’t seem to find all the parts take a quick second to watch the Mission 2 The Hunt For Weevil X walkthrough video. Next, grab the air pump to put air in the boat. You are now ready to put the motor and the propeller on the boat so grab both those items from your pack as well. Now jump in the boat and drive to the right staying along the shoreline until you reach the next beach. There are some valuable items on this beach that you need to locate to get past this first part of the mission. Make sure you find everything you need from this beach or you will have to come back. The first item to collect is the apple that is washing up against the shore. The next item is the rubber band which is located on the rocks in the back corner next to the green plants. After you locate the rubber band walk left and jump up on the rock and then jump onto the tree branches until you are directly above the blue berries. Once you are up there jump on the branch a couple times to make a berry fall then climb down and put the berry into your backpack. Watch the Mission 2 The Hunt For Weevil X walkthrough video if you are having troubles climbing up to the top of the tree. 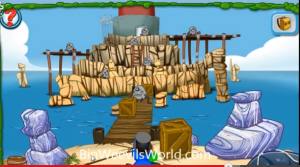 Now that you have the blue berry get back into your boat and head to the island with the docks on it. When you get to the island there will be a lady sitting down in a chair. If you can’t find it stop what you are doing and watch the Mission 2 The Hunt For Weevil X walkthrough video. When you reach the island walk over to the tree straight in front of you and wait until a hot pepper drops then pick it up and put it in your backpack. Get back in the boat and drive to the next beach way to your top left. This is sometimes hard to find so if you are confused watch the video to find it. When you reach the beach you need to find the cork bucket that is being washed up on the sand from the ocean and the piece of wood that says “pull fire”. This piece of wood can be found on the rocks in the back corner similar to where the rubber band was on the first beach. After you grab the piece of wood jump to the right and climb the tree to reach the top where you should be directly above the berries. When you get to this spot jump on the branch a couple times to knock a berry off the tree and onto the ground then pick it up. If you can’t locate something pause where your at and watch the Mission 2 The Hunt For Weevil X walkthrough video quick. Get back in your boat and drive down to the right to reach a small island with a few bigger rocks on it. There is quite a bit to do on this island so pay attention. The first thing you want to do when you get off your boat is to attach the rubber band and the wooden “pull fire” piece to the sticks on the left of the boat. Next, grab the pepples on your left and shoot each one at a tree/branch to knock down the different fruit. After you have knocked down all three fruits aim your slingshot at the large peice of wood standing up. When you knock this down you will be able to use it as a bridge so you can pick up the axle looking thing laying on the big rock. Watch the Mission 2 The Hunt For Weevil X walkthrough video how we launch each pebble to get the fruit down. Make sure to grab all the fruit and after you do get in your boat and drive up to the right until you reach a small island with a palm tree on it. Here you will have to give all five fruits to the fisherman and make fish stew so he will give you some supplies to use later. The first thing to do is give him all the fruit one at a time. Once he has caught five fish through the hot pepper by the fire pot to start the fire. Watch what happens! Next, grab the fish that are hanging and put them in the pot to cook them. When the stew is done cooking use the coconut shell to fill a bowl to use later. Make sure to grab the coconut shell when it is full. You can now grab the item in the window of the house and the palm tree leave to use on the next island. Again, if you are confused where to find the items take a minute to watch the Mission 2 The Hunt For Weevil X walkthrough video. Once you have all your items drive to the item with the docks where you found the hot pepper. As you reach the island talk to the women and give her the items you have collected to get the air conditioner working again. In return she will make your boat a speed boat so you can get past the currents to reach the next islands. 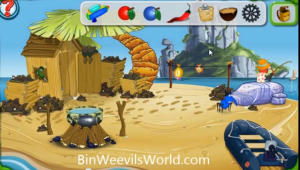 Take a look at the Mission 2 The Hunt For Weevil X walkthrough video to see which island and what lady we are talking about. After you get your speed boat drive to the right and up the current to the big island with a big beach on it. In order to talk to the crab you must place the bowl of fish stew in front of his house. When he eats it he will be willing to give you a sleeping potion but first you must beat him five times in a row in a game of hangman. Good luck, this is pretty hard to get through and all puzzles are different. When you have completed the hangman game drive up and all the way around to the next island. Watch the Mission 2 The Hunt For Weevil X walkthrough video and see where we drove to locate it. Right away on the island you will have to take down all the gaurds so equip your weevil right away with the gun. When you beat all the quards and walk through the door you are almost done with the mission. You only have a couple more things to do. You first need to distract the criminal away from the launch desk so walk to the right outside past the garage door and stand next to the machine then pull down the lever. Next, quickly walk back to where you were to hide. Wait for him to walk out and walk to the launch desk and click on the door release button. Now you should be standing in front of four buttons a (square, circle, triangle, and and x). You need to find the correct sequence to open this up. The code is on a piece of paper to your left. Click on it and find the correct sequence. Everyone’s will be different. When you get it open you now need to point the arrows in the right direction to self destruct the building. Watch the Mission 2 The Hunt For Weevil X walkthrough video to see the correct sequence. Congratulations, you have beat the second mission and complete the Mission 2 The Hunt For Weevil X walkthrough. Please leave a comment below to share with us your thoughts of this mission.